Toll-Free has become a critical solution or branding, marketing and customer interaction. It has grown beyond a voice-centric service to become a multi-channel communication platform. Toll free services are extremely common and have demonstrated fruitful for organizations, especially in the regions of customer services and telemarketing. These services has customarily given potential clients and others with a "free" and advantageous approach to contact organizations. Likewise, clients may now send instant messages to toll free numbers, inasmuch as those numbers are "text enabled," and organizations can send messages accordingly. This service shows the new function in charging. A call to a service subscriber will be paid by the called party. All charges are levied on the service subscriber. The service is free of any charge to the calling user and is accessible from networks of other Operators also. Toll-Free can drive different conversation services. And for many consumers, that means a more convenient way to interact with an organization. While email and texting have become important in both personal and business communication, customers tend to pick up the phone when they are farther along in the buying process. A Toll-Free service remains one of the simplest way to create branded interactions with a customer base. It is commonly used as tools in branding and marketing campaigns, the use of toll free numbers can define corporate identity as well. These are easy to remember, which encourages repeat business and word-of-mouth marketing. The fastest growing segment of how how individuals utilize Toll-Free is advertisement tracking and marketing. Toll-Free services can be embedded into online and offline ads. When consumers respond to these, the advertiser can track consumer response information related to the respective ad. Businesses gain better insight into call volumes, trends and patterns. 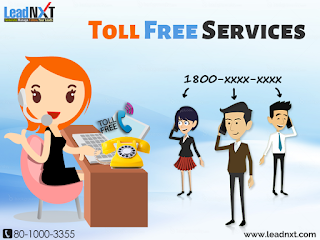 Toll-Free are one of the most reliable services for business. Companies from every industry, including health-care, communications, travel, education, high-tech, and more offer these services to help customers with questions about products or services. I was not aware about the actual need of Toll free services...but your blog helps me to better understand the needs and importance of Toll Free Services.